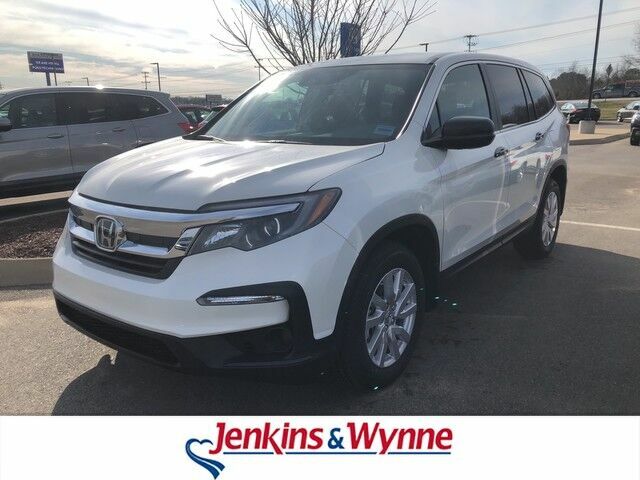 This outstanding example of a 2019 Honda Pilot LX is offered by Jenkins & Wynne. This Honda includes: WHITE DIAMOND PEARL BLACK, CLOTH SEAT TRIM Cloth Seats *Note - For third party subscriptions or services, please contact the dealer for more information. * Want more room? Want more style? This Honda Pilot is the vehicle for you. You'll love the feel of AWD in this 2019 Honda Pilot. It provides a perfect balance of handling power and control in virtually every driving condition. Just what you've been looking for. With quality in mind, this vehicle is the perfect addition to take home. TEXT: 214.914.1866 CALL: 931.538.7505 EMAIL: Sales@JenkinsAndWynne.com. Our pre-owned come w/ an oil change, windshield wiper fluid check, 50k mile compression check, atleast a 32pt inspection sheet, the AutoCheck vehicle report, and a 12month/12k mile power train warranty (on a vehicle w/ 80k miles or less/10 years or less/ excludes Diesels, also excludes Bargain Corral Vehicles). This is already over a $200 savings to you! Jenkins & Wynne has been proudly serving the Clarksville area since 1953!